Shop styles from Better Home & Gardens. After a few years of use, every mattress begins to lose its shape, developing lumps, ridges and valleys and becoming less comfortable. That's why you should replace it every few years with a new mattress. Fortunately, technology has made it so that you have many mattress types to choose from, and these are available for all bed sizes. You can save money on your new mattress purchase because we have low prices, every day, on everything. You can even buy new bedding to go with the mattress as well. There are six basic sizes for mattresses: twin (30 inches by 75 inches), full (54 inches by 75 inches), twin XL (39 inches by 80 inches), queen (60 inches by 80 inches), king (76 inches by 80 inches) and California king (72 inches by 84 inches). This is important to know if you're buying a different-sized bed for your home. Once you know what size mattress you need, you can decide what type to purchase. Innerspring mattresses One of the oldest and most popular styles of mattress, this type of mattress uses a wrapped steel support system. The style of the coils and how they're wrapped, padded and connected, differ by brand. 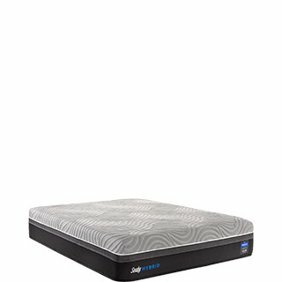 Many innerspring mattresses have pillow tops on one side or both, although less expensive ones don't. Gel mattresses Gel mattresses feature a foam material that contains gel to form the mattress's support, and that material provides varying levels of comfort and heat dissipation. Latex foam mattresses Latex mattresses feature foam that comes from petroleum-based or plant-based materials, and they feature foam as part of the support system and in the outer layers. Memory foam mattresses Also known as visco elastic foam, these mattresses include high-density polyurethane foam that's used as part of the support system and on the outer layers, which adapts to the shape of the sleepers. Hybrid mattresses Hybrid mattresses combine the best parts of both innerspring and foam mattresses. Innerspring coils are interspersed with one or more kinds of foam support. This foam takes many forms, including latex, visco elastic or polyurethane. Some even combine innersprings with gel-filled foam for support. Pillow top mattresses Pillow top mattresses are available on all types of bed mattresses, with the pillow top on one side or both, especially on higher-end mattresses. The thickness of the pillow top varies by mattress and can be made from fiber or foam materials. air mattresses Although some air mattresses are only filled with a single pocket of air, some have multiple chambers to allow for more flexibility and are usually covered in a cloth or foam material that has padding underneath. Box springs are available for all sizes of mattresses and work best on mattresses that you flip every so often to keep the springs or foam from becoming weak. It also helps even the mattress out if the surface is uneven for any reason. If you have a platform bed or a one-sided mattress, you generally have no need for a box spring. However, if you have a warranty on your mattress, check your information. Some mattresses require the use of a box spring or the warranty is null and void. Although the heyday of their popularity was back in the 1970s, some people still prefer to sleep on a waterbed. The gentle motion of the mattress helps some people sleep better than a traditional mattress can. Mattresses for waterbeds are available in all traditional sizes and feature an inner bladder that fills with water. Most waterbeds come with a low-wattage heater for those cold nights. Waterbeds have vinyl coverings that must be used specifically with waterbed frames. Some come with double-walled surfaces and reinforced corners for more leak protection. For those who have a mattress without exterior padding or want additional padding to sleep, mattress pads and toppers are the answer. Mattress pads use many of the same materials as the mattresses themselves, including memory form and gel-filled foam. Some have fillings that are more like pillows and have down or down alternative as the padding. The thickness of mattress pads varies from 1 inch to 4 inches or more. mattress toppers are similar to mattress pads, but these sometimes go onto the fitted sheet covering the mattress rather than encasing it. These offer temperature control properties as well, especially the gel-filled ones.